Travel credit cards offer valuable rewards for all, whether you travel for business, pleasure, or both. Excellent perks like free checked bags or complimentary airport lounge access are the standard - both enticing and well worth it. From points and miles to luxury perks, these travel credit card offers from our partners are the best around. Among credit cards' best perks are travel rewards toward your spring vacation, whether it's relaxing in San Diego, hiking in New Zealand, or scuba diving in the Bahamas. The best travel credit cards can point you toward rewards that you can redeem through travel reservations including airfare, hotels, rental cars and more. But how to choose? Here, we arm you with the tools you'll need to choose the best rewards card for your lifestyle, both as a spender and an earner. Should you get a travel rewards card with an annual fee? Whether you are trying to figure out the types of travel cards available or how to choose a card, we can help. This general-purpose travel card was already a solid, straightforward product, not only offering excellent rewards benefits, but providing no foreign transaction fee and up to $100 credit for Global Entry or TSA Pre-Check when you use your Venture Rewards – perfect for shows and shopping in London. But now there's more than just the standard rewards, which include 50,000 miles after a $3,000 spend within 3 months from account opening and 2X miles on every purchase. The Venture Rewards partners with 14 airlines, with the possibility of more to come. There's also the 10X miles on spending at thousands of hotels through hotels.com/venture. That means a $2,000 stay brings you 20,000 miles. No other major card offers this other than the VentureOne Rewards card. This card also enjoys the travel and shopping benefits of Visa Signature, including complimentary concierge service, extended warranty, shopping discounts and auto rental collision damage waiver. It's rare when the Sapphire Preferred shouldn't be the first card you pull out of your wallet when dining or traveling. That's because you earn 60,000 points after a $4,000 spend in the first 3 months of account ownership and 2X points on worldwide travel and dining. Add to that, you get a 25% bonus in points when you book travel through Chase Ultimate Rewards. That means your 60,000 bonus points can become $750 in travel, compared to $500 in travel with the sign-up bonus of the Venture Rewards. 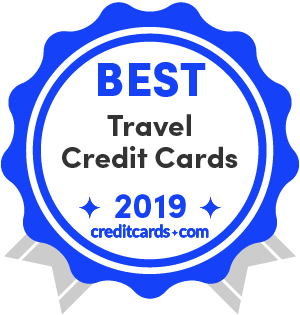 This card also offers primary rental car insurance, which means it is used before your personal car insurance is used, and there is trip delay insurance, as well as no foreign transaction fee. As with the Venture Rewards, the VentureOne Rewards enjoys a partnership with hotels.com, which means hotel spending can bring you 10X miles on thousands of hotels through hotels.com/venture. An otherwise simple card, the VentureOne Rewards allows you to make purchases without thinking about your rewards while earning 1.25X miles on all other purchases. You can also earn 20,000 miles after a $1,000 spend within 3 months of account opening for your sign-up bonus. While the 0% intro APR for 12 months on purchases and balance transfers isn't the most robust, the regular APR is lower than major competitors, at 14.24%-24.24% variable. There are no foreign transaction fees, miles won't expire for the life of the account and there's no limit to how many miles you can earn. This card is a great option for travel thanks to the versatility and inclusiveness of its travel rewards, which earn 3x points per dollar spent. This includes spending on flights, hotels, taxis, and even gas stations. There is no annual fee or foreign transaction fee, further strengthening the card's areas of usefulness. Outside of travel, the card also earns 3X points on eating out, ordering in, and popular ride-share services. Last but not least, it has a sign-up bonus of 30K points for spending $3,000 in the first 3 months. The Discover it Miles card is unusual in a number of ways. First, there's no annual fee, unlike many of its travel competitors. Also, while it doesn't have a sign-up bonus, as with other Discover cards, your cash back will be matched at the end of your first year. There are a few differences between this card and its competitors. For example, the Bank of America Travel Rewards card has a higher ongoing rewards offer than the VentureOne Rewards, at 1.5X points vs. 1.25X miles. Furthermore, the BofA Travel Rewards credit card's sign-up bonus is superior at 25,000 points at $1,000 spend in the first 90 days of account opening. Bottom line? If you are looking for a low-maintenance travel card, the Travel Rewards card is the way to go, given that you don't have to think about what you are spending on. If you plan to do a fair amount of spending within specific travel categories, then another card such as the VentureOne Rewards may be better. If you don't love the idea of chasing points, but you want a solid travel card, this is a great option. In additional to earning 2X miles on all purchases this card currently features a sign-up bonus of 70,000 miles after a $5,000 spend within the first 90 days of card membership. Redemptions are easy with the Barclaycard Arrival Plus, which has a snazzy portal that clearly shows which charges are available for redemption. There's also a 5% bonus on miles redeemed for travel statement credits. This card is a game changer because it includes gas stations among the travel purchases which earn 3X points, which means you'll earn that much more on road trips over Spring Break. The same cannot be said for all travel credit cards. Beyond that, the Citi Premier comes with a hearty welcome of 50,000 points when you spend $4,000 within the first 3 months. 50,000 points are worth $625 in airfare, which is competitive with other luxury travel cards. Its 2X points on dining out and entertainment is a nice bonus as well. Lastly, its $95 annual fee is waived for the first year of membership. For avid travelers looking for their next credit card, the Premier card is an option well worth consideration. With boosts in all of your rewards, this hotel card goes the extra mile in your travel. Earn 125,000 bonus points after a $2,000 spend within the first 3 months of card membership; 12X points on eligible purchases at participating Hilton Portfolio hotels and resorts; 6X points at U.S. supermarkets, U.S. restaurants and U.S. gas stations; and 3X on all other eligible purchases. The Ascend's $95 annual fee isn't waived, which does not compare well with similar travel cards, and the Hilton Honors' TPG point valuation is at just over half a cent, at $0.006. But because the rewards are so high, this card is still worth your while. For example, the 125,000-point welcome bonus is worth $750, an impressive intro offer by any standard. Earn 40,000 points after only a $1,000 spend within the first 3 months; earn 7,500 points each anniversary; and earn 2X points on Southwest purchases, as well as hotel and car rental partner purchases. There is no foreign transaction fee, but the $149 annual fee is not waived the first year, which is pricey for the sign-up bonus offered. The Sapphire Reserve's pricey annual fee of $450 may give you pause, but you'll want to look at this card's valuable features, such as 3X points on worldwide travel and restaurants right after you earn your $300 travel credit, and a whopping 50% bonus when redeeming through Chase Ultimate Rewards. In addition to the $300 annual travel credit, there is also a 50,000-point sign-up bonus after $4,000 spend in the first 3 months from account opening. There are other travel features such as up to $100 application fee credit toward Global Entry or TSA Pre-Check and access to more than 1,000 airport lounges worldwide. What are travel credit cards and how do they work? What type of points or miles does this card offer? Are you earning rewards in a program run by the card issuer, or by a co-branded partner such as an airline or hotel chain? Most importantly, how much value can you receive per point or mile redeemed? What is a travel credit card? A travel credit card is one whose rewards are best redeemed for travel reservations. Many credit cards offer rewards that can be redeemed in many ways, including for travel reservations. A true travel rewards card will offer the most value when its points or miles are used for travel reservations, as opposed to other options such as cash back, gift cards or merchandise. A travel rewards credit card is also more likely to offer travel-specific benefits such as travel insurance or priority service and other perks when using the card's co-branded partner. Travel rewards cards offer points or miles that can be redeemed for travel reservations. These rewards primarily come in two ways. First, these cards may offer new applicants a sign-up bonus, typically after meeting a minimum amount of spending in a certain amount of time. For example, an airline credit card might offer new accounts 50,000 frequent flyer miles after spending $3,000 within three months of account opening. Also, a travel rewards card will offer rewards for spending, often including a bonus for purchases from the airline or hotel partner, or for purchases from certain categories of merchants. Once your account gains enough rewards, you may redeem them for award travel reservations. These might be awards made directly with hotel or airline partners, reservations booked through a designated travel agent or statement credits that reimburse you for travel reservations you've already booked. The most difficult part of evaluating a travel credit card can be estimating the value of the rewards that you'll earn. For example, many travel rewards cards offer frequent flyer miles or hotel points, but the value of these rewards can vary. Furthermore, airlines and hotels are free to change the value of their points and miles at any time, and often with no advance notice. On the other hand, some programs have a very clear value for each point redeemed, with several simply offering one cent in value per point or mile. Those that offer rewards in a program operated by the card issuer. Those that offer points or miles with a travel provider. You'll find several types of cards with reward programs, operated by the card issuers. Some award points and miles can be redeemed for travel reservations through a designated travel agency, such as the partnership between the Capital One Venture cards and hotels.com. Other times, bank-operated programs allow cardholders to redeem their rewards as statement credits toward travel, such as the Barclaycard Arrival Plus® World Elite Mastercard®. Then there are bank programs that allow you to transfer your rewards to airline miles or hotel points, such as Chase Ultimate Rewards or Citi ThankYou. Finally, some bank-operated travel reward cards give you multiple options to redeem your points or miles, such as Bank of America Travel Rewards. Some of these cards can be luxury products that offer valuable travel perks and benefits, but with a high annual fee. Also, there are general travel rewards cards that are offered to small-business owners. Alternatively, there are many travel rewards cards that offer points or miles in programs operated by a co-brand partner. The two major types of partner cards are airline cards and hotel cards, although there are some affiliated with an online travel agency. When you use one of these cards, you'll earn points and miles with the travel provider or travel agency, and the use of your rewards will be subject to the terms and conditions of its loyalty program. However, the card issuer is still setting rates and fees, issuing statements and processing your monthly payments. As with the general travel rewards cards, there are partner cards considered premium or luxury products. These cards will typically offer extensive benefits when traveling with the co-branded airline or staying with the affiliated hotel chain. Finally, there are also co-branded cards for small business with airline and hotel partners. Travel cards are just one of many types of cards, including cash back cards, balance transfer cards, low interest cards, and those for fair or poor credit. Before selecting a travel rewards card, you should examine their advantages and drawbacks. The most obvious benefit of a travel credit card is the ability to redeem your points or miles for award travel. Not only can award travel reservations be very valuable, but many cardholders really enjoy the chance to use their rewards to treat themselves to a vacation, whether to Aruba in April or Malaysia in May. These cards frequently have generous sign-up bonuses that can reward you for travel in the hundreds of dollars. Beyond travel rewards, a good travel card can offer you travel perks just for having the account. For example, an airline credit card will often give you a free checked bag and priority boarding, while a hotel credit card user will receive elite status that can offer room upgrades, late checkouts and even free breakfast. Other travel cards can offer you statement credits toward airline fees or toward the application fee for Global Entry or TSA PreCheck. Finally, the right travel card can have plenty of travel insurance policies, to cover you when your trip doesn't go as planned. For example, many cards come with lost or delayed baggage insurance and trip delay, trip interruption and trip cancellation coverage. With all the attractive rewards and benefits that travel cards offer, it's easy to lose sight of some of their disadvantages. First, most travel reward cards are designed for those with good or excellent credit. If you've had significant credit problems in the past, then you may not qualify for the best travel credit card. Next, consider the costs of a travel rewards credit card. Like other kinds of reward credit cards, travel cards will typically have a higher standard interest rate than similar, nonreward cards. If you tend to carry a balance on your credit card, you may still want to hold a travel card for its benefits, but you'll likely pay less interest on charges made to a card with no rewards. Also, many of the most competitive travel rewards credit cards will have an annual fee, which isn't the case with most cash back credit cards and retailer reward cards. There can be blackout dates and other restrictions that put the kibosh on what you might have thought would be free trips. Points can expire and might be restructured or devalued. Many travel cardholders can find these reward programs to be complicated and confusing. The frequent flyer programs and hotel loyalty programs usually have many pages of terms and conditions, and members can sometimes be disappointed when a program doesn't live up to their expectations. Finally, there are some credit card users who simply aren't excited about travel rewards. This can include those who rarely travel and others who just drive to their destinations and stay with friends and family, and have no need for award flights or hotel stays. Also, there are consumers who prefer to spend their vacation time at home, perhaps doing a spring home renovation. These types of consumers would be better served by foregoing points and miles and using a cash back credit card instead. One of the primary disadvantages of travel credit cards is that most come with an annual fee. While some credit card users will always refuse to pay an annual fee, many have found these fees to be worth it to receive these benefits. To decide if a fee is worth it, you must first consider the net cost of the card, after any fee credits. For example, the Chase Sapphire Reserve has a $450 annual fee, but it also has a $300 annual travel credit, making its net cost $150 per year, so long as you use the credit. Next, consider the added value of the benefits and rewards you receive, compared to the best available alternative with a lower annual fee or none. If the value of these rewards and benefits comfortably exceeds the difference in annual fees, then the card will be worth it for your needs. Nevertheless, it's important to re-evaluate the card each year before paying the annual fee. Once you decide to open a new travel rewards credit card, you should take into consideration your travel habits when choosing the right card for you. Choose an airline card if you're looking for perks. When selecting an airline rewards credit card, the most important travel tendency to consider is how often you'll be using the co-branded airline. All of these cards will offer you more points or miles for purchases made from the co-branded airline, so it makes sense for frequent travelers to have a card affiliated with the airline they use the most. Frequent flyer cards will also offer you benefits when traveling on the airline, such as priority service, discounts on inflight purchase and checked baggage fee waivers. This is another reason why you'll want to consider a card from the airline that you use the most. One important tip: To get the right travel card, know your airline hubs. Delta, for example, uses Salt Lake City as a hub, giving consumers who live in the area or travel often for spring or winter skiing an abundance of Delta routes to choose from. So if you live near Salt Lake, or travel there frequently, you'll want to consider the co-branded Delta cards. Finally, you'll want to find a card that will let you redeem your reward points or miles for flights to where you want to go. For example, if you are dreaming of using your airline rewards for a spring trip to Paris, then you won't want to earn points with Southwest Airlines, which doesn't offer any overseas flights. However, you should always consider if a frequent flyer program has any airline partners that offer service to where you want to go. For instance, Alaska Airlines doesn't fly to Paris either, but you can redeem its miles for award flights on several of its partners that offer overseas service. Choose a hotel card if you're looking for free nights. When it comes to choosing a hotel card, there are other travel tendencies that you need to think about. First, consider your travel budget. An economy traveler will not have much use for the benefits offered by the Ritz-Carlton Rewards card, since it can cost hundreds of dollars per night to stay at one of its properties. Likewise, there's no point in using a credit card from a budget chain when you prefer to stay at midrange or luxury hotels. You also need to look at the geographic regions where you normally stay, and if the card's hotel chain has many properties there. For example, hotel companies such as Choice and Wyndham tend to have properties in small towns and rural areas, while you'll find most Hyatt and Starwood hotels to be in midsized to large cities. And if you are an international traveler, make sure that the hotel credit card you are using offers a sufficient selection of properties in the countries that you commonly travel to. Choose a general-purpose travel card if you're looking for flexibility. With a general-purpose travel card, your travel tendencies won't mean as much. While an airline or hotel card can limit how you use your rewards, the sky's the limit (as it were) with a general-purpose travel card. That is because with these cards, you are typically able to redeem your rewards for statement credits toward any travel reservation. Or, you'll be able to make reservations directly with the card issuer's designated travel agent, which will allow you make reservations with most airlines and hotels. However, there can be one thing to think about with a general travel rewards card. Some allow you to transfer your rewards to airline miles or hotel points with several different programs. If you are a traveler skilled at redeeming points and miles, you'll often find it possible to realize exceptional value from each point or mile. This is especially true when you're able to redeem your airline miles for expensive flights in business or first class, or last-minute reservations. You can also receive tremendous value from your hotel points when you are able to redeem them for stays at some luxury properties or for stays during high-demand periods. Choose a luxury travel card if you're looking for airport lounge access. With a luxury travel card, one of the primary benefits will be the airport lounge services offered. When selecting one of these cards, you'll need to look at what lounges are part of this program, and compare them to your travel habits. For example, both the Citi Prestige and the Chase Sapphire Reserve offer you a membership in the Priority Pass Select airport lounge program. And while this program features more than 1,000 lounges around the world, the vast majority is outside of the United States, and there may not be a lounge at your home airport. Or, there may be a lounge at your home airport, but it might be in a different terminal than the airline you use most often. You also need to examine the terms and conditions of the lounge membership. Some, such as the Delta SkyMiles Reserve card from American Express, offer free access to just the cardholder, while others allow complimentary visits by a limited number of guests or family members. The Chase Sapphire Reserve card, for example, offers free lounge visits for the cardholder and an unlimited number of guests. Also, many luxury travel cards affiliate with an airline or hotel reward program. These cards offer extensive benefits when you travel with that airline or stay with a member hotel. These benefits are only beneficial if they align with your travel habits. Choose a business travel card if you have business expenses. Business travel cards are much like their consumer-focused counterparts; however, they tend to offer better rewards for common business purchases such as office supplies, advertising and telecommunications services. And when it comes to your travel tendencies, you'll need to look at how you'll benefit from the card's program. If you'll only be charging your business travel to your small business card, then you'll want to make sure you have a card from an airline or hotel that meets your business needs. But at the same time, you'll still want those rewards to be valuable to you when it comes time to redeem them for your personal travel needs. When looking at travel cards, you may be tempted to avoid a card with an annual fee, and there's something to be said for that. But there's a lot more to a travel card than just the annual fee. Here, we look at the different factors, including the sign-up bonus, ongoing rewards, benefits and other features. As you know, the choices can seem overwhelming, but exciting, with hotel and airline cards, as well as cards that partner with multiple brands. Co-branded cards are good for the loyalist, while general-purpose travel cards are good for the travel shopper. We're going to look at a general-purpose card, the Capital One Venture Rewards, and one of our favorites, the Chase Sapphire Preferred. The annual fee is typically a factor and can vary widely, but in this case it's a wash, since both waive their $95 fee the first year. Also, while most travel cards now offer no foreign transaction fee, be sure to check, because world travel can be a drag if you are stuck paying 3% on every expenditure. While the Venture Rewards sign-up bonus is 50,000 miles after a $3,000 spend within the first 3 months, the Sapphire Preferred offers a higher 60,000 points after a $4,000 spend within the first 3 months. Additionally, the Venture Rewards offers 10X miles on every dollar spent at hotels.com/venture. Both allow transfers with multiple travel partners. Meanwhile, when you book through Chase Ultimate Rewards with the Sapphire Preferred, you get a 25% bonus on points. Finally, while the Venture card rewards 2X miles on all purchases, the Sapphire Preferred only rewards with 2X points on worldwide travel and restaurants and 1X point on everything else. Most of the best travel cards offer travel and shopping benefits, such as travel insurance, rental car insurance and extended warranties. If, for example, you often rent rental cars, the Chase Sapphire Preferred may be the best card for you, because its car rental insurance is primary, meaning that it covers you even before your personal auto insurance. Finally, consider a travel rewards strategy that includes multiple cards. For example, you might have an airline credit primarily to enjoy priority boarding and to receive a free checked bag. At the same time, you might also have a general travel rewards card that you use for most of your spending. In fact, frequent travelers may carry an airline card, a hotel card and one or more general travel rewards cards, to realize the unique benefits offered by each. How you spend your travel rewards is at least as important as how you earn them. Airlines and hotels are making it easier to earn rewards from their travel credit cards, but it can be an ever-increasing challenge to find the most value when the time comes to redeem the points and miles that you earned. If your travel rewards credit card offers you points or miles with an airline or hotel program, then you'll have to work especially hard to get the most value per point or mile redeemed. With many airline frequent flyer programs, you'll realize the most value by redeeming your miles for expensive, last-minute flights, or for seats in business or first class. However, it can be very difficult to find available award seats on these flights. Thankfully, there are several ways to increase your chances of success when looking for award seats. First, you'll want to plan your award trip as far in advance as possible. Most airlines will open their flights to new reservations about 11 months in advance, and if you're able to book your travel then, then you'll have one of the best opportunities to find available award seats on the flights you want. However, you may also find the seats you need later, as some airlines will vary their airline award seat availability. Another suggestion is to be as flexible as possible by considering different dates, times and destinations, rather than just hoping to find a specific award flight available on a certain day. You can also consider alternate departure and arrival airports near your destination. Furthermore, the fewer award seats that you need on the same flight, the more likely you are to find them on a single flight. Therefore, a family of four will have a lot better chance of finding award flights if they are willing to “split the team” and divide their reservations between two different flights. Another important way to maximize the value of your frequent flyer miles is be sure to consider all available airline partners. Most carriers are part of one of the three major international airline alliances: SkyTeam, Oneworld and the Star Alliance. These airlines allow you to redeem your miles on flights operated by their partners, as well as some partners that are not part of the alliance. These partners can offer award seats to your destination, and most airlines will price their partner awards at the lowest mileage levels. Also, these partner awards sometimes don't appear on the airline's website, so you'll have to call to book these awards. Alternatively, you could consider hiring an award booking service. There are several enterprising award travel enthusiasts that use special tools to find award availability and have extensive experience doing so. While it will cost about $200 per person to hire an award booking service, this could be money well spent when you are able to use the lowest possible number of miles to book business or first-class award reservations that can be worth thousands of dollars. Finally, you may find that after you've made your reservation, the airline could make a schedule change. This is your opportunity to contact the airline and request alternate flights that are more ideal for your schedule, even if there isn't award availability. So long as the alternative flights are operated by the airline whose miles you redeemed, not a partner, it will be able to open up award space in response to a schedule change that affected your reservations. It's a lot easier to redeem hotel points than airline miles. Many of the major hotel loyalty programs have a policy of allowing customers to redeem their points for any unsold standard room. Companies with this policy include Starwood, Hilton, Wyndham and Hyatt. To receive exceptional value from your points, you can redeem them for award nights during peak travel periods such as holidays and special events. And if you find that a hotel has rooms for sale, but you can't redeem your points, it can help to contact the property directly, or reach out to their corporate headquarters to ensure that the property is following the program's policy. When it comes to the travel rewards programs offered by card issuers, it can be easier to redeem your rewards for the most value. When your points or miles are worth a fixed amount toward statement credits or travel reservations, then it doesn't really matter how you redeem them. However, some of these programs give you the choice of redeeming your points for travel reservations, or transferring them to airline miles or hotel points. Programs with this feature include American Express Membership Rewards, Chase Ultimate Rewards, Citi ThankYou points and the Starwood Preferred Guest program. Transferring your rewards to airline miles or hotel points can offer you the most value, but only when you can find the award seats you want, or a great hotel award stay. You want to examine all the different frequent flyer programs that you can transfer your points to, including which airline partners you can book flights with. Often, this can be a complicated task. To ensure that you are getting the best value, you should compare the number of points needed to book a flight or hotel directly, with the number of frequent flyer miles or hotel points you would need to transfer. With spring upon us, now's a great time to redeem rewards for a long weekend for a late-season ski trip to Breckenridge, Colorado, a jaunt to Japan, or enjoying the balmy winds of the Caribbean. That can mean redemptions for a hotel stay in your favorite town; business class on an international flight; or a cruise to the Bahamas. You and your significant other want to a take a long weekend to do a little skiing in Breckenridge, Colorado, in March using your Chase Ultimate Rewards points from your Chase Sapphire Preferred Card. First, you can book through Chase Ultimate Rewards and earn a 1.25 cents boost, or transfer your points to airline partners such as Southwest or United, which fly into Denver. This way, you might get points discounts but 60,000 points or miles are typically enough for two round-trip, domestic flights in economy class with United, and remember, there are no blackout dates with Southwest's Rapid Rewards. When it comes to using your credit card rewards for free hotel stays, you could transfer their points to Hyatt's loyalty program, called World of Hyatt, where free night stays are often available for 8,000 to 15,000 points a night, such as Hyatt Place Park City. Or splurge and stay at Hyatt Centric Park City for ski in/ski out access at 20,000 points a night. Finally, you may also book a rental car or airport transfers by using points directly at the Chase Ultimate Rewards Travel Center. When you do this, your points will be worth 1.25 cents if you have the Sapphire Preferred or 1.5 cents if you have the Sapphire Reserve. There are other cards, such as the Chase Ink products, that also offer boosts when using the Chase Ultimate Rewards portal. One final thought – it would make sense for you to look for discounted airfare and hotel stays before transferring your points. You've decided to take a trip to Japan, and want to use your credit card rewards to travel in business class. You have miles in the American Airlines AAdvantage frequent flyer program that you received from your personal and business travel, as well as miles from your credit card. While you don't have the 125,000 miles American requires for a business-class flight to Japan, you have hotel points in the Hilton Honors program. By transferring some of your hotel points to American Airlines miles, you'll have enough miles for this award. You find the award seats on American's partner, Japan Airlines, and ask American to hold the award, which it will do for up to five days, at no charge. Then you transfer some of your Hilton points to American miles and ticket the award. Say you and your family of four want to get away to the Bahamas. You choose to earn miles with the Barclaycard Arrival Plus World Elite Mastercard because of its easy redemption options. You'll get unlimited 2X miles on all purchases plus 70,000 bonus miles for spending $5,000 on purchases in the first 90 days, and you can get statement credits for travel purchases you've made. You can then use your credit card rewards to receive statement credits to offset the cost. By the time you take the trip, you've earned even more miles, which you are able to use to pay for your rental car and some of your activities. Beyond the rewards you can earn from spending, there are three other types of travel benefits that top travel cards cards can offer. Many credit cards offer some form of travel insurance, but travel rewards cards tend to offer the strongest set of policies. The most common is travel accident insurance, which will offer you a benefit if you are injured or killed in an accident on a common carrier, such as an airline, train, bus or cruise. Another form of travel insurance found on most credit cards is rental car insurance, which can replace the costly policies that you would buy from the rental car company. Travel rewards credit cards are likely to carry trip cancellation and trip interruption coverage, which will compensate you if you are unable to take or complete a trip due to illness or a variety of other covered reasons. Trip delay insurance will cover your expenses if a flight is delayed or canceled, causing you to incur unexpected costs for meals, hotels or alternate transportation. Also, baggage loss and delay insurance can supplement any compensation provided by the airline. Finally, there are some premium travel cards that will offer you medical evacuation insurance, that will fly you home for treatment if you become sick or injured in a foreign country. A travel credit card may also come with a variety of benefits with its partners. If the card is co-branded with an airline or a hotel chain, then you should expect benefits with flying or staying with that company. For example, most airline cards will offer priority boarding, a free checked bag and discounts on in-flight purchases, while premium cards will give you an airport lounge membership. A hotel card will offer you elite status which typically grants you priority service, room upgrades and late checkouts. And regardless of whether a card has a co-brand partner, it might feature a variety of other benefits from third parties. For example, the Visa Signature and World Elite Mastercard programs offer many travel and shopping discounts. And a premium credit card may offer airport lounge access through a lounge network not associated with an airline, such as Priority Pass Select or the American Express Centurion lounges. A newer credit card benefit that's growing in popularity are fee credits that can lower the cost of travel. For example, several credit cards offer statement credits toward the $85 application fee for the TSA PreCheck program or the $100 application fee of the Global Entry Program, which includes TSA PreCheck. Other cards offer hundreds of dollars in statement credits toward any travel related expense, while others offer credits toward airline's fees. Jason Steele is a credit card journalist and a leading expert in the personal finance industry. He specializes in award travel and is a Senior Points and Miles Contributor at The Points Guy. His work has been featured on Yahoo! Finance, MSN Money, and Business Insider. You can reach Jason by e-mail at editors@creditcards.com.